Empowering Youth for Work in Pakistan aims to increase youth employment and increase the role of young people in decision-making. We want to reduce their vulnerability to climate change impact and improve young women's sexual and reproductive rights. Pakistan is a country that is extremely prone to climate-related disasters. Violence against women is widespread and women have far less economic opportunities than men. Oxfam has been working in Pakistan since 1973 to increase climate resilience, end gender-based violence and ensure poor women have access to land and economic opportunities. In our team of 120 people we have experts in conflict transformation, humanitarian assistance, climate resilience, sexual reproductive health rights of youth, markets and enterprise, and education for girls. Oxfam Pakistan partners with over 30 civil society organisations, with the private sector, including small and medium-sized enterprises as well as multinational corporations such as Unilever, and with government institutions such as the Ministries of Climate Change and of Federal Education, the Youth Parliamentarian Forum and the National Commission for Status of Women. We also work very closely with research institutes and academia. Empowering Youth to Work focuses on Jamshoro district in Sindh province and Layyah district in Punjab province, both located along the Indus River. Here, extreme flooding occurs annually and drought is also a recurring problem. 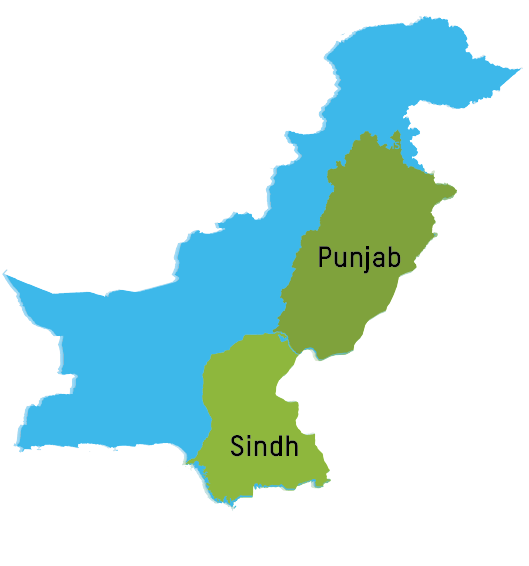 Punjab and Sindh are two of the most impoverished provinces in Pakistan; patriarchal structures limit women's access to resources and control over their own life. Of the 1 million inhabitants in Jamshoro and the 1.5 million people in Layyah, 80% live in rural areas. Most of them earn a living from agriculture and livestock farming, sectors which are susceptible to natural disasters. Overall, wages are low and work is unstable due to the frequent disasters and related displacements. Oxfam Pakistan selected the sectors that provide the best opportunities for large numbers of young people, sectors with expanding markets and potential to support climate resilience and adaptation. For young women, small-scale farming and product processing turn out to be the most relevant and accessible opportunities, since their mobility is very limited due to strict social norms in both districts. Opportunities for youth to gain an income can be found in, among others, horticulture, spices, fruit and vegetable pulp, herbal medicines, processed seeds and meet, compost and fodder. In addition, the growing information technology sector is increasingly looking for a qualified labour force. Looking at the informal sector, there is great demand for appliqué work in local and national markets. Read the latest news, personal stories, research and other information from the Empower Youth for Work programme in Pakistan. College of Youth Activism and Development (CYAAD) (potential new partner; assessment currently in progress) CYAAD works with young men and women who are in dire need of social and technical guidance to carve a bright future for themselves. CYAAD works to empower Pakistani youth by providing them with opportunities for education, technical training and broad-scale engagement. Bargad is a youth-led organisation with institutional capacity on SRHR and life skills, and strong lobbying and advocacy work experience with government institutes. Its mission is to promote peace, justice and cooperation among Pakistani youth. TIE Pakistan serves as an entrepreneurial community center for women interested in starting or expanding an existing business. The Centre provides mentoring, business connections, specialised training, connections to the community, media attention, access to markets and capital, along with the technical tools and resources necessary for taking any business to the next level.